As a collector since the age of 10, Emanuele developed a deep interest and passion in mineralogy and mineral collecting, specializing in aesthetic minerals from Italy and worldwide. At the age of 18 he officially established his own company to deal with minerals and he also began to do field collecting. This led to the natural need to learn how to make self-preparations for cleaning and preparing his own specimens to sell to finance his collecting trips all over Europe and Africa, improving on existing trimming, cleaning and repair techniques in the process. Emanuele earned his Masters in Geology (Ore Geology and Industrial Minerals) at the University of Milan and this has given him an added perspective to his practical experience thanks to the scientific background he obtained at the University. He has travelled afield and collected extensively, particularly on the Island of Elba and in Madagascar. During the years in University and after, he continued in perfecting a diversified knowledge and experience of specific lab treatments (in early partnership with Dr. Federico Pezzotta, who also now runs a mineral laboratory), and now he owns one of the most important preparation laboratories for mineral specimens, Nimeral Min-Lab located in Milan, Italy. Art and Minerals are the same. Having grown up in Italy surrounded by the relics of ancient cultures in museums, our laboratory was naturally influenced to use the same techniques considered not only acceptable but necessary in the various worlds of art and antiques. Since the early 1970s the mineral collector has had the need to make some basic cleaning and repairs on the specimens found and marketed, with the same idea as the curators of Italy’s museums: to preserve the specimens as unique and unrepeatable natural art objects. 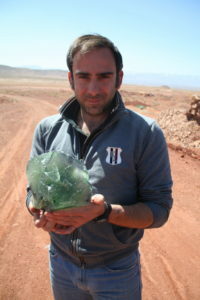 Nowadays with the same purpose of preservation, new techniques and materials are tested and applied within the mineral specimens preparation industry, to obtain a more durable and more perfect conservative result on mineral specimens, as it is done in the archaeological artifact industry e.g. pottery, artistic artifacts, etc. Today, thanks to the developing of this conservation-oriented philosophy and advances in technology in his lab and in others around the world, we are able to preserve a larger number of fantastic “treasures of nature” that otherwise would have been destroyed from the ravages of time, industrial mining operations, and/or natural Earth crust degradation.